You can use art and design to express yourself, solve a problem and inspire other people. What will you create? Your own fashion line? A picture book? How about a community mural? We're challenging kids to design and create over winter break with Chicago Public Library's Winter Learning Challenge from December 17 to January 7. Read (books, magazines or websites) for 20 minutes a day for at least five days. Complete an activity and share what you discover and create. Keep track of your progress on the Winter Learning Challenge log (Spanish Winter Learning Challenge log). Return your completed log to any CPL location by January 14 to receive a prize. Design Your World recommended reads. Brick: A small red brick journeys across the globe to find her place in the world. Along the way, she encounters castles, temples, estates and much more. The Junction of Sunshine and Lucky: Auggie Jones and her grandfather turn trash into treasure while trying to save their neighborhood from the House Beautification Committee. Take a few old boxes and a little paint to create recycled art on a cold and snowy day. Read Ish by Peter H. Reynolds, then create some crumpled paper art similar to the art in the book. Cut up some old magazines to inspire your budding artists to draw and collage. Create a new look by watercoloring an old T-shirt using only ice and liquid dye. Design your own “finger legs” puppet, then act out a story with your character(s). Try making edible paint so even the youngest artists can create a masterpiece. 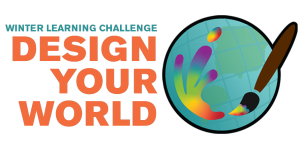 Participate in one of our Design Your World events. The Winter Learning Challenge is made possible through the Chicago Public Library Foundation.